Some body who lives close go take a photo of one the locks so i can ID it! Here's a photo of the locks from the inside. Can't find a better picture. ETA: That photo doesn't necessarily show the layout of his apartment unit. This building has various layouts for different units. But the locks are probably the same for all units. Last edited by William Parcher; 7th September 2018 at 06:38 PM. Bottom thing is the handle. Middle thing is a rotary-style manually-operated bolt. A lever is turned left or right to move the bolt in or out. Top thing is the electronic lock mechanism. This is a training thing. At some point, we stopped teaching police to assess and started teaching them to go for their gun first. Where we once would have taught this officer to move to the door frame and assess the situation, we now teacher her to reach for gun and "stop the threat". I'm not excusing her behavior. She clearly should have known it wasn't her apartment. We've trained police over the last 15 years to live and operate in a world that doesn't exist. We've trained them to think they are patrolling the streets of a community with an active insurgency inhabiting it instead of their neighbors. She opened the door, and training took over. Even if she absolutely thought she was in her apartment she should never have had her first reaction be "reach for gun, shoot whoever is inside!" That just should not be how a cop should react. They should try and investigate. Assess. Not just trigger happy. Is there any factual reports as to why she shot him? It's not just a pitiful level of training, but coupled with the attitude of "I'm going home every night to my family no matter what," and the warrior cop mentality, having the ability to lie with impunity, and most importantly, an absurd lack of accountability in every day policing. Lower down the list, the excuses given by the courts (and by extension, society) for cops not actually knowing the laws they're enforcing and the apparently common issue of rejecting higher intelligence police applicants play roles in these kinds of outcomes. Crime is at the lowest levels we've had in forty years (apparently going up a tad but still no where *near* the crime of the 80's) yet fear of crime, especially by police, is at all time highs. That probably played a part in this particular case and certainly has in the other cases. I think demographics and the upturn in the economy has more to do with it than police shooting innocent people. The benefit of the doubt to the point that cops can shoot anyone under any circumstance and successfully claim it was justified. An increased militarisation of the police with more weaponry in general available to them, meaning the emphasis is on use of weapons. A culture of fear and being under siege within the police itself. Poor recruitment methods meaning the wrong people are getting into the police. I think that pretty much covers why the US police have ended up in the state that it is. Like the gun problem, the police problem is too entrenched for the USA to be able to solve it. As a result, Americans just need to get used to having a far higher chance of being shot by criminals, youths, angry people and the police than any other western nation (and many others besides). You missed out the plethora of really small police departments that can't have the resources for proper management support or oversight and training but still have guns. Putting them under the state forces would provide quite a lot of clarity. Collecting and publishing accurate statistics of shootings and comparing different groups in similar areas to flag up discrepancies would help. The UK had some similar problems - albeit at the start of the nineteenth century, so it is possible to change. If she felt threatened, she could have called for backup instead of trying to get in. She put herself in that situation. There is no excuse for this shooting. There are problems with the big police forces as well. Yes, but at least if a police force of 700 officers* gets it right there it the chance of institutional learning and continuity, as well as sufficient slack for training and career progression. If you have a force of ten people (so about the median police force size in the US) even if they get it right, the're likely to have to relearn once a key person retires. There isn't the size necessary for appropriate support. Witch burnings were at an all-time high in the seventeenth century, and actual real witch hexes were at zero. Clearly the policy worked. Nope, but I can see why someone could think it's the case. In truth, many police were brutal towards nonwhite people - and in many cases poor white people as well. And in truth, we still have little or no insight to many of them - departments trash complaints after a few years, have other cops "investigate" them, there's not so much as a "This guy's terrible, he can't be a cop anywhere in the US any more" database, or really even a comprehensive database of people killed by police. and many unions and societies actually prefer it this way, setting up a police department with at best questionable accountability to anyone in the community of elected government. This effectively means that, while in a town like Ferguson you end up with what amounts to a white supremacist police department, in many cities police are able to set up grotesque divisions that end up mired in corruption and cruelty. In truth, many police were brutal towards nonwhite people - and in many cases poor white people as well. And in truth, we still have little or no insight to many of them - departments trash complaints after a few years, have other cops "investigate" them, there's not so much as a "This guy's terrible, he can't be a cop anywhere in the US any more" database, or really even a comprehensive database of people killed by police. and many unions and societies actually prefer it this way, setting up a police department with at best questionable accountability to anyone in the community of elected government. There was also that special (at least one that I saw, there could be others) done by some local TV station which I think was in Florida which sent people into local police stations asking for complaint forms or what the complaint process is and naturally filmed under cover and the terrible, inexcusable behavior by the approximately dozen officers who would lie, intimidate and threaten these guys when they asked for information. The cops would demand knowing the information-seeker's personal information, what the complaint was about, which officer and when it happened and all that and would lie about having a process in place, or lie about a form not being available and so on. The police chief(s) were interviewed after the fact and couldn't offer any explanation but kinda blew off the interviewer by saying some vague, "I'll look into it" kind of thing. Not every station did this but something like 90-ish percent of the stations ran the information-seeker out with no information or with no complaint form. All this does is highlight the fact that police in general don't apparently want to hear when their officers misbehave and don't particularly care that society doesn't trust them. It's just sad most especially since this is a fixable problem. Why was he living in an apartment so similar to her's? Maybe she'll be able to pull the popular politicians' trick of saying she takes full responsibility, the reward for such honesty being the cancellation of consequences. I hear she's "devastated," so we can start counting down to "suffered enough." "Hers". The word is already possessive, it doesn't need an apostrophe. Sorry, but people can and do storm into apartments and shoot people dead over such matters. Somebody want to give TM an English lesson? The 's is needed to mean "that apartment". Otherwise, everybody would want to know "her what?" There is a name for that.something like "3rd person past petite participle plursal posseseive"
Seriously? "Hers" is possessive. "Her" is not. "This is her. This is her cat. This cat is hers, not his." Do you apostrophize "his" as well, to show possession? "Hi's apartment"? "His's apartment"? eta: Clearly you were joking, sorry to fly off the handle. Grammar is not a matter to be treated lightly. We finally found the one thing TragicMonkey won't joke about. Cop identified, charges still pending. This is her second shooting. The word is already possessive, it doesn't need an apostrophe. It may not need it, but it so wants one. Neighbors say he has this red doormat outside his door unlike other tenants. If so, it would make his doorway unique and easily identified. This photo of his door seems to show that there is no electronic lock at all. All this nonsense about lock details. Seems simple, guy hears someone scrabbling around trying to open his door so goes to look. Cop thinks "Oh **** there's a black dude (or something) in my flat." ETA TM will be proud. His. No apostrophe. Last edited by fagin; 9th September 2018 at 06:54 AM. It looks like the door lock cylinder has been removed - as evidence? I would hope in these situations the officer would be administering first aid and trying to stabilize the victim. And assuming, as she may have, that this was a dangerous, possibly armed individual, why did she not step away from the door to safety and cover it while assessing the situation? It occurs to me that proper procedure might include more than just administering first aid. She has to establish her own safety. If she truly believes that she just shot a burglar in her own apartment maybe she ought to immediately establish that there isn't an accomplice still lurking in her apartment. That would require a quick "clearing" of the unit. Check every room and closet. It would be a bad situation if you were doing first aid and then another burglar guy suddenly appears with a gun pointed at your head. I still presume that she discovered it wasn't her place moments after shooting him and before she called dispatch. Without any alternative way the enter? If the electronic lock fails then there is no way in to your apartment? I've enlarged to image and it appears that the lock cylinder is still there but it's slightly recessed so it looks like an empty hole. It's a bit of a moot point. Either she could get into the apartment or she couldn't at first. Neither way should she have shot the inhabitant. Mistaking it for her own apartment is not an excuse either way. I agree the issue of lock details seems like a derail if, as it appears, the occupant opened the door from inside. Under what circumstances would he have been shot then, unless she already had her gun at the ready, and did not wait for an explanation and did not look beyond the man in front of her to notice that it wasn't her house? Of course we can't know for certain what happened and how, and since the shooter is the only living witness, we probably never will. 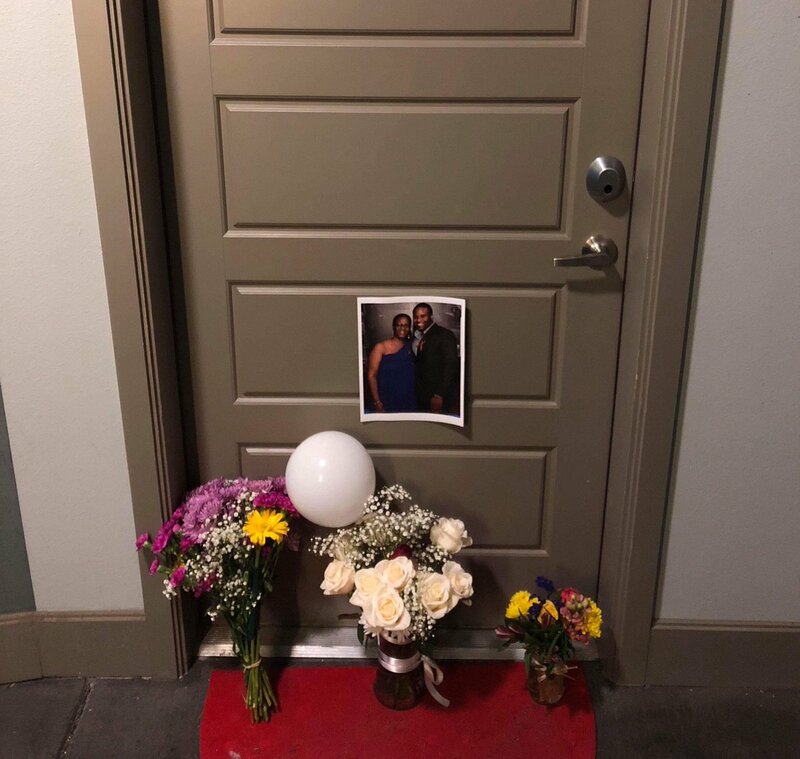 But I suspect that the initial presumption that it was her door closed her mind to any doubt, and that with that certainty, she was prepared to shoot before it opened, shot the occupant on sight, and did not even perceive the apartment itself until after shooting. It's a terrible sort of human error, for which one can feel a certain sympathy, but it's mitigated by the fact that (in my opinion at least) people who go around lethally armed have volunteered to follow a stricter set of rules.